What to do about a bird among the rafters? At least, they thought it was a bird. Might it not be wise to hang up a few precautionary bunches of garlic, just in case? Christeen Jones relates this and a few other tales of the Dunhill Choir. “Trying to determine just how long Dunhill Church Choir has been in existence has proved to be an almost impossible task! Having spoken, at length, to some of the choir members, a couple of them finally admitted to being members for over forty years! One particular member recalls, at the tender age of eight years old, having to wait in the sacristy with her mother while the choir mistress cleared up after Mass. The reason she had to wait was to quench the oil lamps on the church walls! I think that will give you some indication as to how far back Dunhill Church Choir actually goes! Choir members are local people of various ages and backgrounds who enjoy singing together in a friendly environment. The choir aims to be inclusive, welcoming women, men and young people of all ages and abilities, and is always looking for new members to join. You donâ€™t have to be a great singer or be able to read music â€“ just have a willingness to learn and join in. We are all keen amateurs. There is no formal audition and there are certainly no fees to pay. You don’t have to sing on your own either â€“ unless you really want to! The choir rehearses on Tuesday evenings under the guidance of our choir mistress, Margaret Moore, and our organist, Anne Kavanagh. We learn each piece of music thoroughly, varying from traditional and classical to folk, and usually include harmonies. We like a challenge and relish the mastering of more choral pieces such as Franck’s ‘Panis Angelicus’, Mozart’s ‘Ave Verum’ and various versions of the ‘Ave Maria’ â€“ to name just a few. In more recent years we have expanded our folio to include many TaizÃ© hymns, along with hymns written by Fr. Liam Lawton, who not only wrote the music for the ‘Millennium Mass’, but also wrote the now famous hymn ‘The Cloudâ€™s Veil’, one of the choir’s favourites. 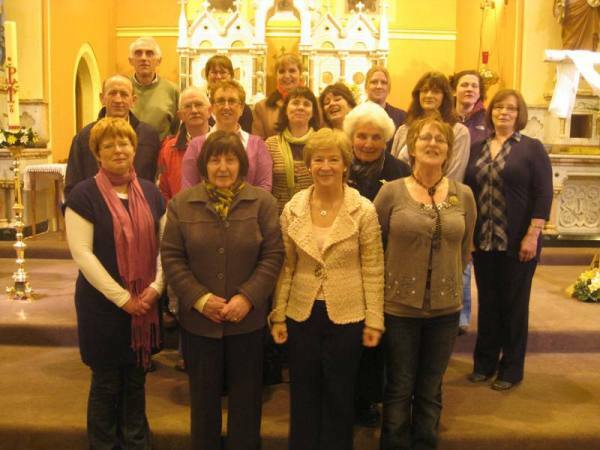 Dunhill Church Choir was honoured to be part of the choir which participated in the Millennium Mass celebrated in Dungarvan in 2000. The choir was also invited to join the St. Otteran’s Choir, which is made up of choir members from the churches in our pastoral area, and has sung at special Masses and carol singing services around the diocese. The choir always looks forward to Christmas and Easter services when we can take the opportunity to perform special pieces for the congregation. We also put on an annual Christmas Concert to raise funds for local charities which are always well supported and enjoyed by everyone. Well â€“ almost always enjoyed by everyone! We remember one year we had a ‘near miss’ when we turned up for the concert to a full church, only to discover the heating had failed! Weren’t we glad of our Santa hats and scarves that year? The congregation was totally understanding, and stayed to the end â€“ even if their toes were frozen by the time they left! We can recall a couple of other eventful Masses over the years. On one occasion, when the choir was right in the middle of singing a hymn in three-part harmony, we had a power cut, leaving us without any music! Never let it be said that Dunhill Choir would let anyone down â€“ being the professionals we are, the show went on and the choir sang the remainder of the hymn ‘a capella’! As it turned out, it was just the trip switch in the sacristy and a kind parishioner had it up and running again before the next hymn was due! Another time, a bird flew into the church during Mass and, of course, being located at the highest point in the church, decided to fly around the choir loft â€“ not a pleasant thing to happen anyway â€“ but when your organist has a phobia about birds?? Over the last year, we have had a wonderful refurbishment of the choir loft including new carpet and soft, upholstered chairs â€“ and we even have electric overhead heating! The parish has also purchased a new piano for the choir which complements some of the more modern hymns. Some choir members play other instruments also, including guitar, flute, violin and tin whistle. In years gone by, Dunhill had a very active youth choir whose members played many varied instruments â€“ this is something we would love to revive in the not too distant future.